Eclipse-watchers Charles and Tyler scored solar eclipse glasses at the Smithsonian's Air and Space Museum. D.C. stopped in its tracks Monday and gaped at the sky. We didn't have a total solar eclipse here, only a partial one. At its peak, about 82 percent of the sun was covered by the moon. But that didn't matter. The attention to the first total solar eclipse to fully travel across the U.S. in almost 100 years, and the fact that the sun was covered up by the moon, still pulled office workers out of buildings, stopped traffic and sent people scurrying for glasses to put over their phones to shelter their lenses. 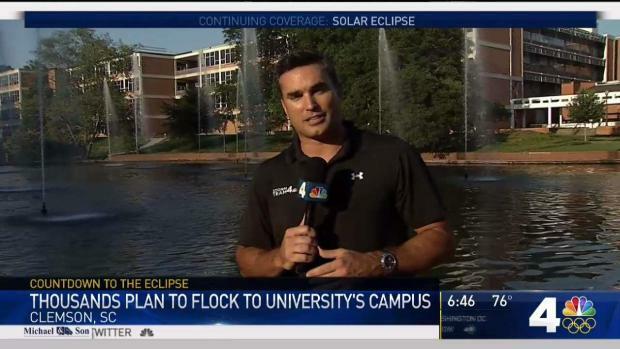 The eclipse isn't completely over; you will be able to see some coverage until about 4 p.m.
Storm Team4 Meteorologists Doug Kammerer and Chuck Bell have traveled to South Carolina to see the solar eclipse.